The Ballymurphy Massacre Families have expressed their outrage at the British government’s response to their call for an independent panel to be established to investigate the Ballymurphy Massacre in 1971. The families have said they are considering a judicial review against the decision. The Independent Panel proposal, which has been presented to both the Dublin and London governments, is based on the model used to investigate the 1989 Hillsborough stadium tragedy in Sheffield, England. However, in a meeting earlier this week with a representative of the British Direct Ruler in Ireland, Teresa Villiers, the families were informed that her government would not be supporting their proposal. The events unfolded hours after the government introduced a policy of internment of republicans without charge or trial. Families of the victims say the case raises serious questions over the human rights record of the British Army in the north of Ireland. They said their proposed approach was not a costly and lengthy public inquiry, but a tried, tested and cost-effective model. The Ballymurphy Independent Panel proposal has already been endorsed by three of the five main parties in the North, by Westminster MPs and by the 26 County Taoiseach Enda Kenny. The Taoiseach told the families in Dublin recently “that the Irish government supports them, and is fully committed to assisting them in their search for justice”. 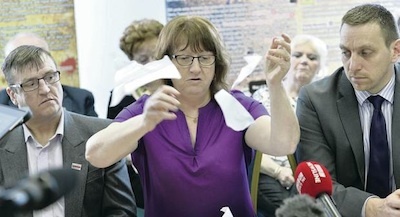 At a Belfast press conference, one of those bereaved by the shooting ripped up a copy of Villiers’ statement and vowed to keep pushing for a public investigation. “We will fight for this until we die,” said Briege Voyle, who was 10 when her mother, searching for some of her eight children as gunfire broke out, was shot in the head. Sinn Fein’s Martin McGuinness told David Cameron on Wednesday that there was no consistency on the part of the British state on the issue of state killings. He was speaking by phone with the British Prime Minister. He said the families of the 11 innocent victims murdered by the Parachute Regiment in Ballymurphy, the victims of Bloody Sunday and those killed in the Dublin/Monaghan bombings were “testament to this reality”. “Only this week the British government told the Ballymurphy families there would be no review of those murders,” he said.